Speaking to a friend of mine recently who is preparing to run his final marathon before being awarded the exclusive “Six Star Finisher Medal”, I was impressed by how well he knew his metrics. He talked about how far he had run, in how much time, how long ago and, crucially, how he was measuring his progress to reach a peak performance level by the date of his final marathon. All the while, he was also being careful not to burn out early or hit a plateau. I don’t know about you but this sounds massively impressive to a couch potato such as myself. However, is it so different from what us teachers are doing in our professional lives? In a similar way to my friend trying to get to his physical best by the time of his race, we teachers want our year 11 students to be at the point of peak performance by the time they reach the summer term. In the new world of progress and attainment, where the dust is only just settling, school leaders are faced with a myriad of metrics in order to be sure that their students’ outcomes are positive each year. How many students are on track for the EBacc? How many are making positive progress within the year group? Which creative or arts subjects are struggling to get the higher grades? How many students are on track in both English and maths? And, is there a pattern between prior attainment from key stage 2 and progress? These are the metrics by which schools are judged and which are crucial in supporting both teachers and students at key stage 4 – but once you know the answers what do you do next? How do you communicate it in a way that has impact and which is simple? These are the burning questions that schools have been asking for the past few years and, in order to try to solve this puzzle, I’d like to share with you what I have been using thus far with great impact. The introduction of what I outline below has helped my schools to boost student progress by more than +0.2, meaning that students on average improved their exam grades by 20 per cent. As well as this, the initiative also allows for a particular focus on students’ prior attainment from key stage 2, and as such streamlines intervention so that lower, middle and upper prior attaining students make positive progress overall. However, before I go into detail, it is important that I spell out two cornerstones of this particular progress checking system in order for you to understand its inner workings. First, the target grades given to students for their end-of-year GCSE outcomes are based on their key stage 2 prior attainment banding. These are also aligned to different subjects based on what progress basket the subject falls into. This data is readily available from the Department for Education and an example is shown below (Table 1). I regularly remind staff that teachers are welcome to review these target grades and can change the grades upwards if they feel it is appropriate. The second cornerstone of this system is that there has to have been a good degree of quality assurance on predicted grades given by teachers. These should be based current grades through assessments, as well as a consideration of factors like attitude and aptitude. The quality and accuracy of predicted grades can often vary and I have found it helpful for teachers to predict a grade by also indicating how sure they are. I do this with a three level scale. So, for example, a teacher would predict a grade 4–, 4= or 4+. Students on target for English, maths and EBacc fall into the gold group. 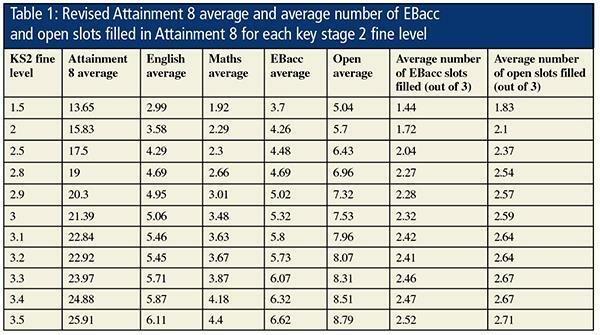 Students who have not yet reached their target grade for their EBacc are grouped in silver. 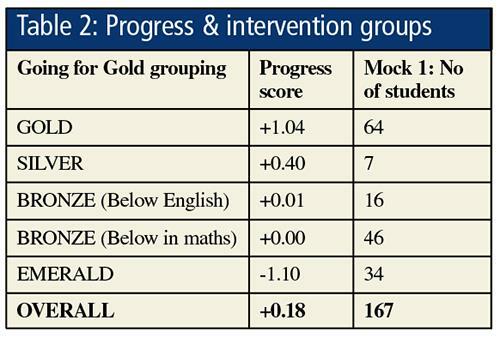 Students below their target in either maths or English are in the bronze group. Students below in both English and maths are in the emerald group. An example is shown below, with estimated progress scores for each student group (Table 2). We can now see the size of individual groups where further intervention is needed, either in or out of the classroom (and sometimes both). Within the bronze and emerald groups there will be a group of students who may only be one grade below their expected target. These students I refer to as “quick wins”. It is important to share these lists of names with heads of departments and teachers in order for them to be aware of the need for extra support for these students in particular between now and the next round of summative assessments. The really interesting analysis of these groupings however, is when we compare them to students’ prior attainment. 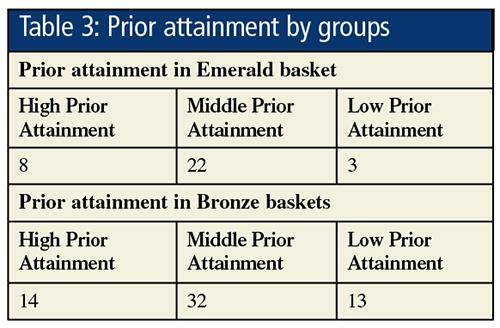 Below, you can see the prior attainment of the emerald group and bronze groups (Table 3). Using this data leaders are able to target intervention groups based on their prior attainment and create high-impact small working groups. This moves us away from intervention solely for students not getting a grade 4, 5 or 7 and instead focuses on the needs of each student in the year group. Branding is something that all project leaders try to do, whether it is a political campaign, a new government initiative or a new Waitrose product line. A good slogan and clear direction for stakeholders never goes amiss. In this vein, I’ve called the above initiative “Going for Gold”. With each round of reporting, students are also given their new Going for Gold grouping. Tutors then meet with bronze students to discuss revision strategies, as well as providing additional resources such as revision books and other study guides. Heads of year meet with all emerald students in order to set targets for attendance to homework clubs as well as any additional interventions the relevant departments might be offering. Creative and arts-based subjects are given a list of all gold and silver students who should be attending their interventions as a priority and crucially meeting their (often higher) target grades. All other year 11 teachers are asked to adjust their seating plans accordingly to ensure that students in the bronze and emerald groups are sat with students who are in the silver or gold groups. In this way each layer of the year 11 pastoral and academic teams are used to play their part in helping students reach their targets. At this point, I think it is important to talk about the pastoral support for students in what is a difficult year for the young people we work with, especially with the demands of the new GCSEs. It is important that all students are supported not only academically but also pastorally through their school life and in no year is this more pertinent than their GCSE year. Emerald students in particular need the additional layer that form tutors and heads of year provide. A GCSE information evening for families where the Going for Gold groups are explained has always been a high-impact way of explaining to students and families how to support their children, as well as publicising the support structures within the school itself. However your school chooses to track their progress, there needs to be a good balance between supporting students both academically and pastorally. The Going for Gold system has made my students leap out of their chairs with joy when they see that they have reached the gold group and for other students who aren’t quite there yet, it is important that they see it as a system of support, rather than anything else. In the end, whether your school is Going for Gold, Pushing for Platinum or Chasing the Cheddar, we as school leaders need to remember that we are preparing students for the marathon that is life. Saqib Chaudhri is associate principal at Oasis Academy Shirley Park in Croydon. He is a graduate from the Future Leaders programme run by Ambition School Leadership and the Institute for Teaching.